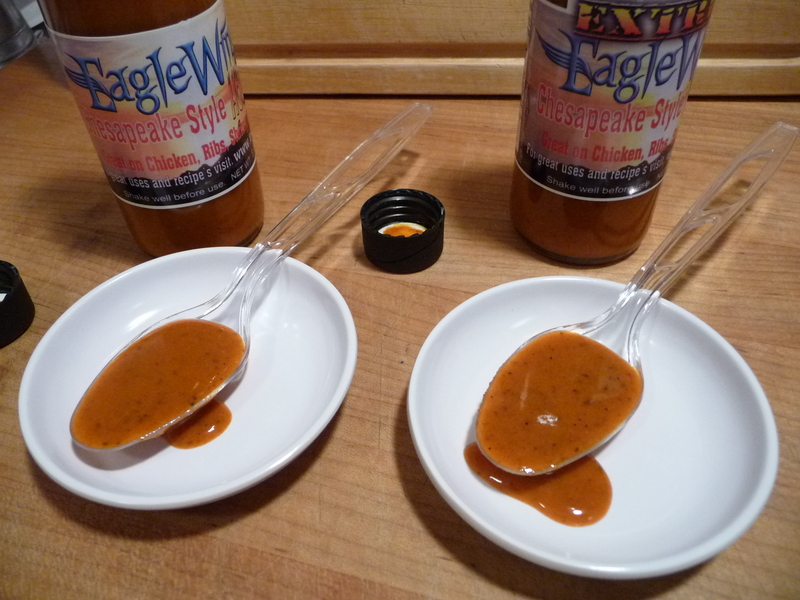 Creator and Chief Eagle Wingz guy, Rick Ewing, provided us with a few bottles of his Eagle Wingz sauces to play with. We spent two evenings with these sauces for this review. At first we simply deep fried some wings, dunked them in the sauce and ate them. Don’t do that. The next evening, we followed Rick’s recipe suggestion to fry the wings, toss in the sauce, them give them a quick zap in the microwave oven (I know, right?) which really tempered the overbearing vinegar taste and mellowed out the sauce. As a side benefit, in our opinion, this extra step of 30 – 40 seconds in the microwave resulted in a perfectly finished wing. The sauce was also a bit more tacky and soaked nicely into the wings. Now we had some delicious Chesapeake style wings. We’re not usually fans of microwaving wings to cook them, but in this case it was simply a finishing touch and it “set” the sauce perfectly and was a huge improvement to the flavor and texture of the finished wings. 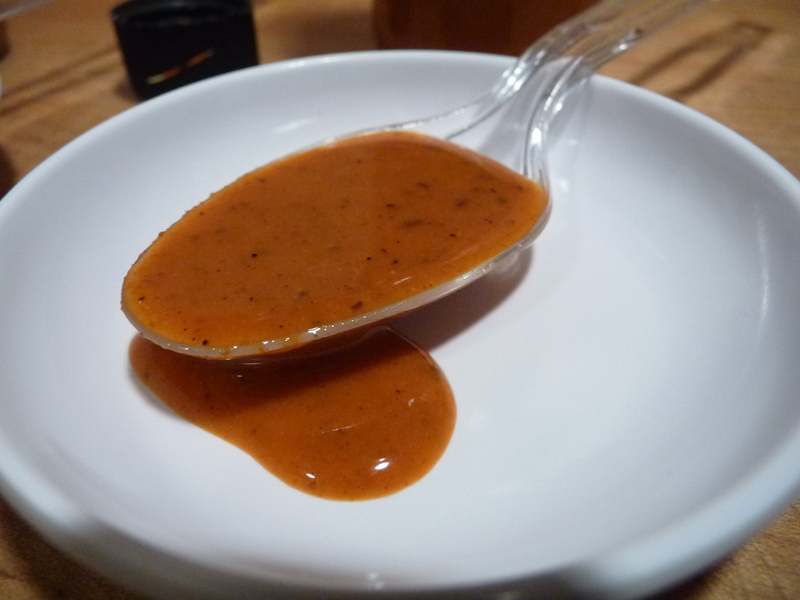 Texture & Appearance: These sauces are thin with an obvious black pepper look (along with other bits of seeds and spices) – color is on the dull orange side. Definitely looks like wing sauce to us. Taste Straight Up: Straight up out of the bottle they are a bit harsh – but they mellow nicely when heated. These are sauces that need to be heated or cooked with, to bring out their flavors and cut the strong vinegar aspect. They wowed us when we followed Rick’s instructions for preparing wings. Original HOT – – falling just between a mild and medium, the Eagle Wingz Hot (original) is a standard cayenne heat level. EXTREME version – adds Capsaicin as the only additional ingredient, and usually we frown upon Capsaicin but in this case it adds a nice level of heat without tasting fake or chemical-like. Still on the lower end of hot. Overall Rating: – A classic “buffalo style” wing taste with the added flavor of spicy crab seasoning make these wings and sauces big winners. Highly recommended! 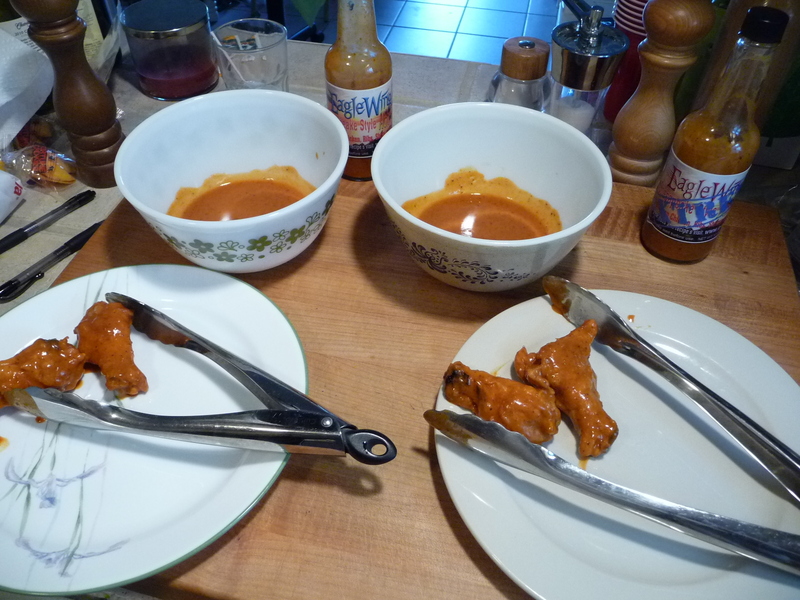 As a footnote, we did do a batch of wings with added butter to the sauce – but that diminished the flavor of the sauces. Don’t do that either. 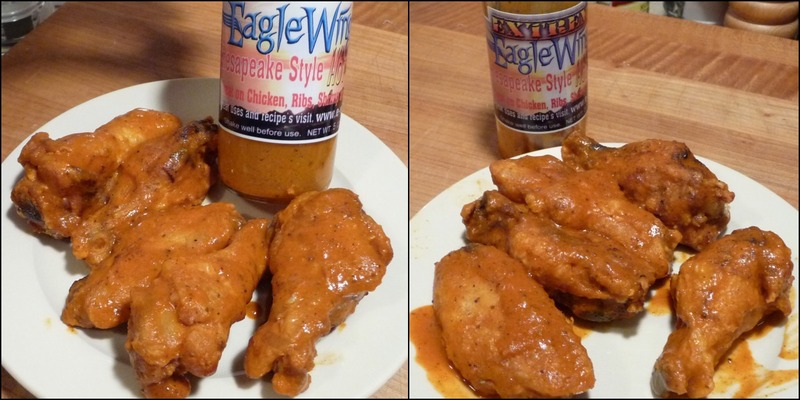 Eagle Wingz Hot Sauce comes in 5 oz bottles for $4.99 and 10 oz bottles for $6.99. There’s also a 1 gallon option for you restauranteurs out there. Purchase. Their parent company, GlobalHotSauce.com, sells many other fine products, so check them out and tell them HotSauceDaily.com sent you! About our Week of Wings series: This is the 4th year we dedicate a full week of reviews, recipes and posts to the Hot Wing. Enjoy and explore our other Week of Wings posts for inspiration and wing-ness! Yup, weird but it works! OMG, it’s Week of Wings already? Where has the time gone!?!? I wonder how the sauce would work on grilled or fire roasted wings? I like celery seed in my slaw and cajun recipes so I’m intrigued. I think the celery seed is key to the “Chesapeake” slant. 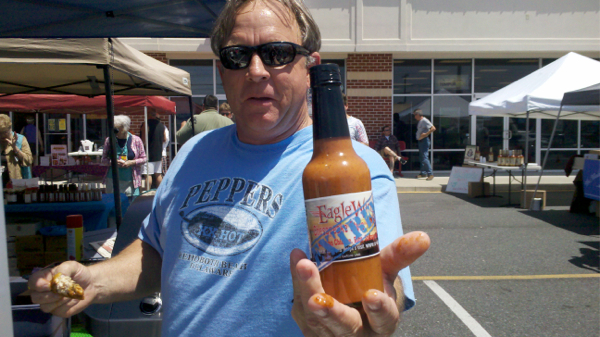 Brian and Marilyn, thanks so much for the review of my Chesapeake hot sauce. 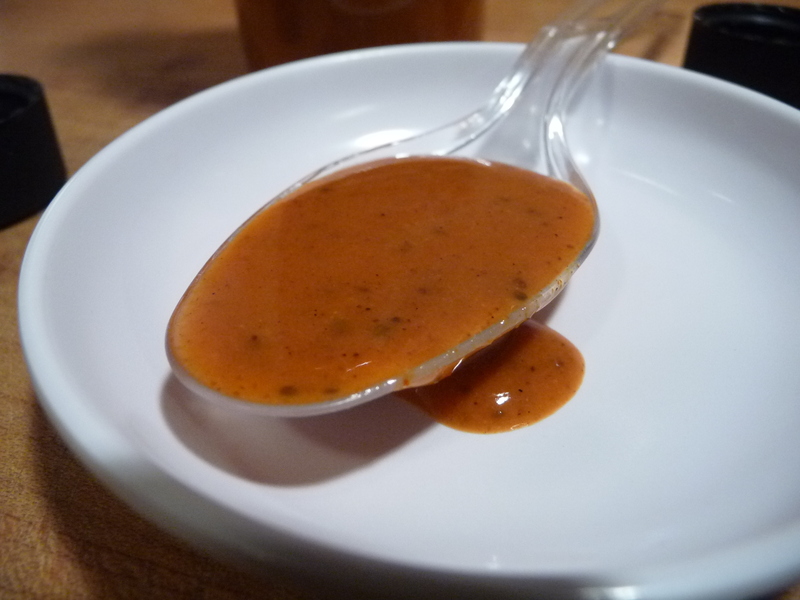 I am amazed at myself that I could actually come up with a sauce that so many people love. And also I agree with you all on the microwave part, but as you have found out it really does set the sauce in the wing. If you are ever in the Seaford area please stop by and check out my store “Something Hot” specialty sauces on Phillips Street. Thanks for everything you have helped my sauce grow in the hot sauce world. Rec’d my order today! I’m so excited. I can’t wait to start the tasting! Thank you, Brian, for introducing me to so many different wing sauces. 🙂 I LOVE the Week of Wings series. And thank you, Rick, for taking care of my order so quickly. Thanks for the order Corrine. Please let me know how you like the sauce and if there is anything else I can do for you. It is a pleasure serving you!